As we are anticipating more snow this week, I am choosing to think Spring! 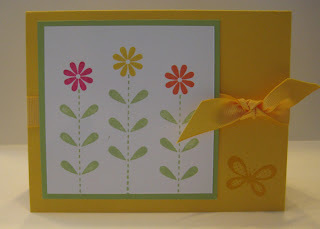 This is one of the cards we will be doing at my Stamp-a-Stack this weekend. It features the new Occasions Mini set, Bold Blossom. If you are local, why don't you join us? This one is a pretty simple one, but it says about all you need to say. Aren't these cute? You can use the same technique for stamping on candles on tealights. Stamp your image on tissue paper and color. I used marker here but have also used colored pencils. Cut the image, and if you use a shape that works in our punches, it's as easy as can be. For a tealight you need to use a hole punch to make room for the wick. 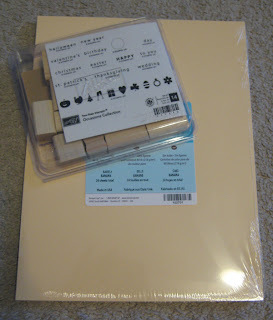 It's a big help to punch the tissue on a piece of scratch paper so that the tissue doesn't tear. Place the tissue on the candle and heat with a heat tool to "melt" the tissue into the wax. It is really still there, but the wax of the candle melts around it. If you were doing a candle, you could hold it on securely while you heat it with wax paper. 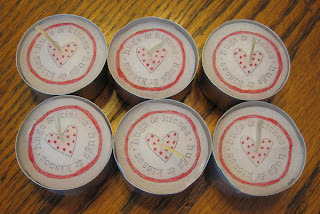 I have been planning for a few months to do a tealight with stamp club sometime soon. And then in my latest APEX swap organized by my upline, I got one of these from another talented demo in our group.... great minds do "ink" alike! As much as I would like to be done with snow, that isn't such a realistic thought. If you can't beat them, join them! 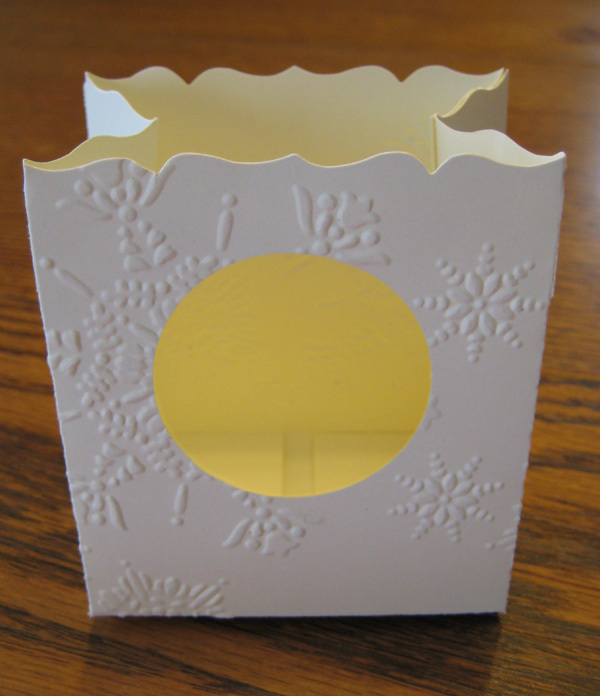 So here's a Fancy Favor Box with a little embossing. 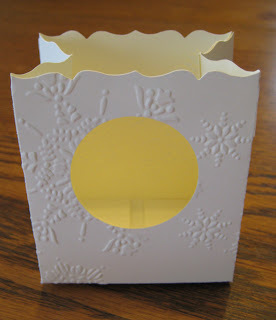 After cutting the favor box, run it through the Big Shot with the Northern Flurry embossing folder, changing the position of the folder each time. I think I ran it through 4 times. Then punch the hole using the 1 3/4 circle punch and cover it with a window sheet and fill with some wonderful goodies. 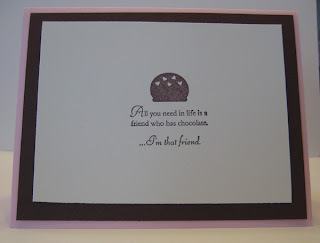 Ever wondered what you could do with Stampin' Up! fabric if you don't sew? 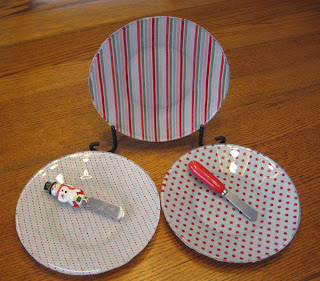 Well with a little Mod Podge, you can make a decorative plate! I wasn't sure about the stripes but they turned out great. Brush Mod Podge on the bottom of the plate, smooth on material, and trim the edges once it dries. I like the feel of the fabric on the bottom but more Mod Podge makes it more durable. And I am told if you spray it with an indoor/outdoor acrylic, you could actually submerge it in water. These need to be cleaned on the top only. Thanks Sherrie for the great idea! Wow! This was my first time with the Black Magic Technique - super easy and super dramatic! Each month in stamp club, I try to include at least one technique and this was what we did this month. It would work on other dark colors, but I just love the bold look of the colors against the black. 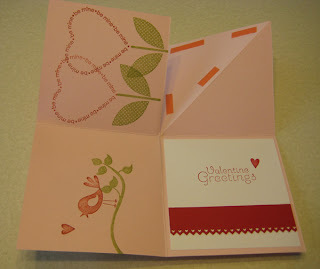 Stamp Whisper White Craft ink on your dark cardstock, heat set it, and then color over the white with colored pencils. It's that easy. I have another partial card made with this technique that you will see in the next few weeks too. I think this is my new favorite technique! I went to visit my friend, Rae Anne, who just had a sweet little baby boy. 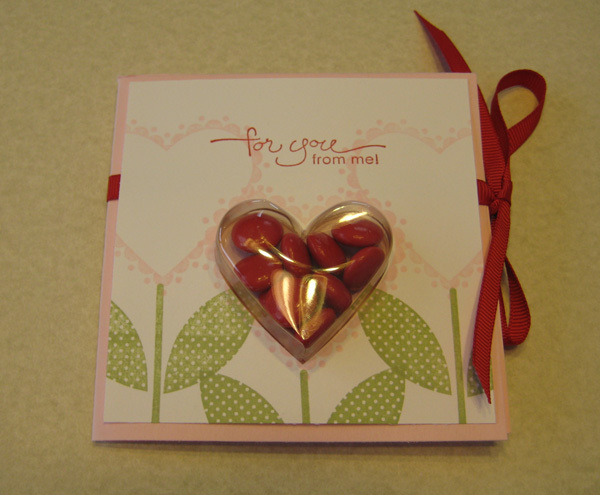 This was the card I took with my gift. 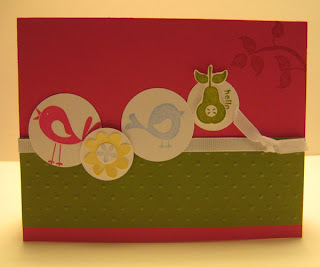 Her baby shower and thank yous used Fox and Friends so it was only fitting I used a critter from that set for her card. To make a onesie card, fold your cardstock long ways, freehand a "7" on both sides (or create a pattern) punch a hole at the neck and for the legs with the 1 3/8" circle punch. Trim a bit at the leg holes with your scissors and finish it off with a bit of a scallop circle. I scored the bottom and added two eyelets using my Crop-a-dile to make it more "realistic". Congratulations to Val W for winning my 10,000K blog candy! Val please email me your address and I will get your prize on the way! Here's Val's comment "Congratulations on all the hits on your blog. I've been visiting your blog for awhile now. I have it bookmarked on my computer. I use mostly SU products, so I like visiting blogs that show cards made with SU items. I like to see cards made with sets I have, or that I can make substituting another of my sets into it. Thanks for the inspiration and ideas your share!" Thanks to Val and all of the rest of you for your nice comments. I enjoyed hearing from the ladies I know and also from people across the country. It was so much fun to read your comments that I may have to have blog candy again before 20,000K ;-) Thanks to all of you for visiting my blog! 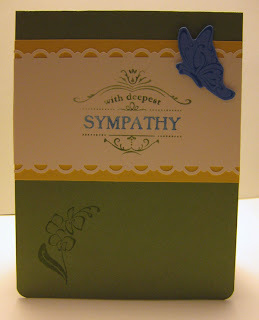 I first made one of these "diorama" cards at my friend's (Julie Davison) Stampin' Up! meeting, and it has only taken me a couple of years to make another one. 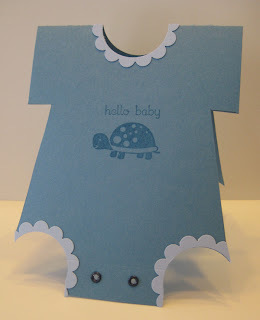 In fact, I have made a few - you may remember my posting a similar card a couple of months ago for Rae Anne's baby shower. This particular card was for stamp club this month, and I did a similar version for a Valentine swap that I was in with other demonstrators. Start with an 8 x 8 square of cardstock. Here's the card showing the back side. And here is an inside view. 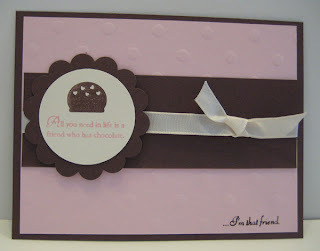 ﻿To Order Stampin' Up! Products On-Line 24/7, CLICK HERE! This card was one of the all occasion cards I did for my last stamp-a-stack. I used the Apple Blossoms level 2 hostess set, and then everyone chose words that suited their needs. 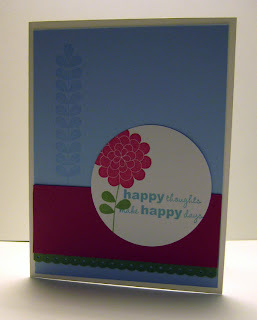 I got the idea for this simple but nice layout from a card I got in a swap from my ImPeckable stampers group. Thanks, Julie! 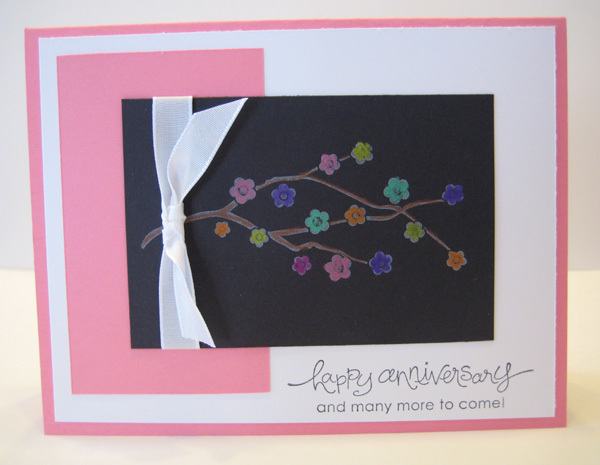 I loved her entire card, but since I didn't have the Designer Series Paper she used nor do I own the stamp set (yet), I changed the colors and the stamps and made a card of my own. I also made a Crumb Cake version too - also nice, but I decided this was more all purpose for the group. 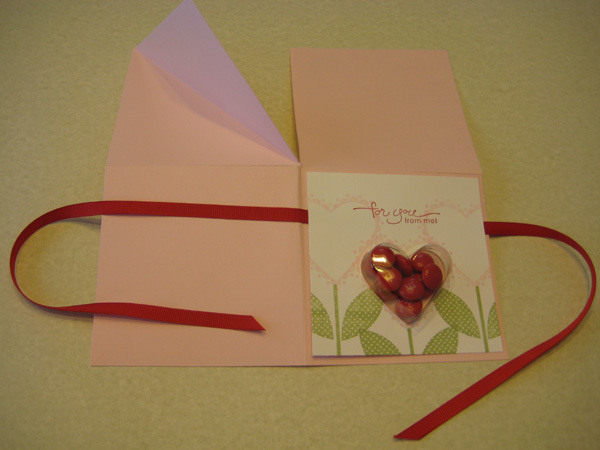 The little green ribbon is made with the Dotted Scallop Ribbon Border punch - only showing the bottom edge totally changes the look of the punch. Sorry for the dark picture... I experimented with my picture taking spot and thought it was a good one... won't be doing that again! 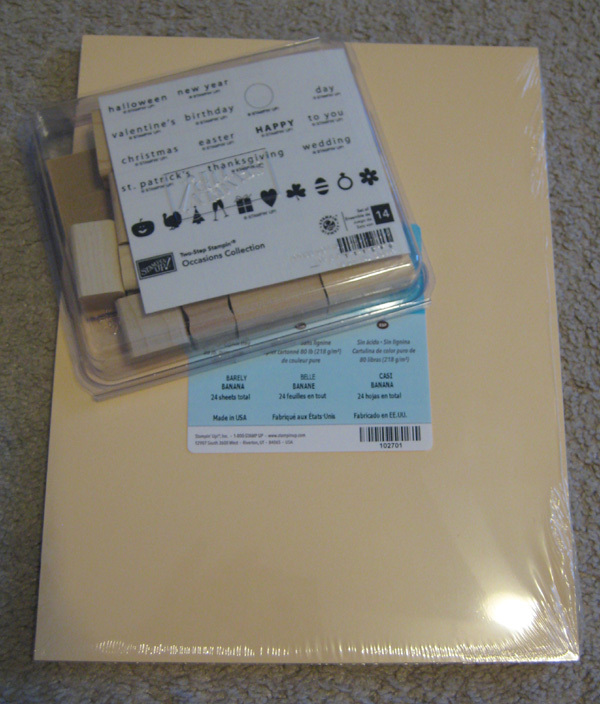 If you ever find yourself stuck without a good card idea, flip through your Idea Book & Catalog. I took the 4 x 4 card in the catalog, changed the ribbon and made it into a full size card. It's a great resource for ideas and to help when you've lost your creative mojo. 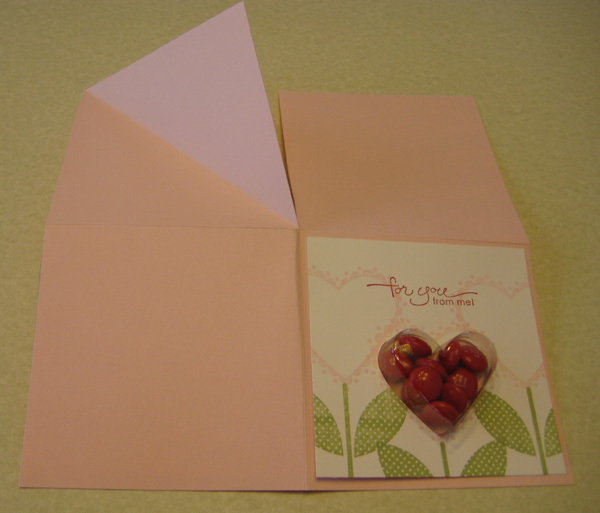 So do what I did and copy the card or you can choose a layout or a color combination you like and make it work with a stamp set you have. Thanks to all of you, I have had more than 10,000 hits on my blog since starting it about a year ago. So it seemed only fitting that I offered some blog candy to celebrate! Leave me a comment (on this post or any others) before January 17 and you will have a chance to win this brand new Occasions Collection stamp set and a package of Barely Banana cardstock in a random drawing. This is the first of what promises to be many cards made with the new Eat Chocolate stamp set in the Occasion Mini Catalog. 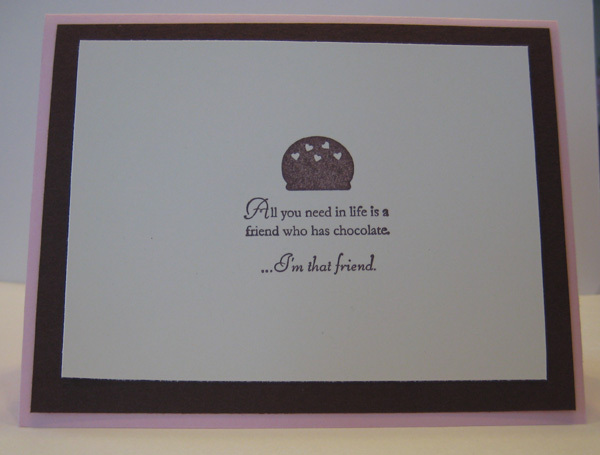 I used a marker to color directly on the stamp so I could split up the words "All you need in life is a friend who has chocolate" and "...I'm that friend". 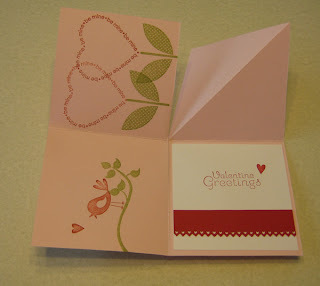 Some of you may recognize this card from my January newsletter. If you would like to receive a monthly newsletter from me, please sign up in the sidebar...a keep watching for more chocolate cards! 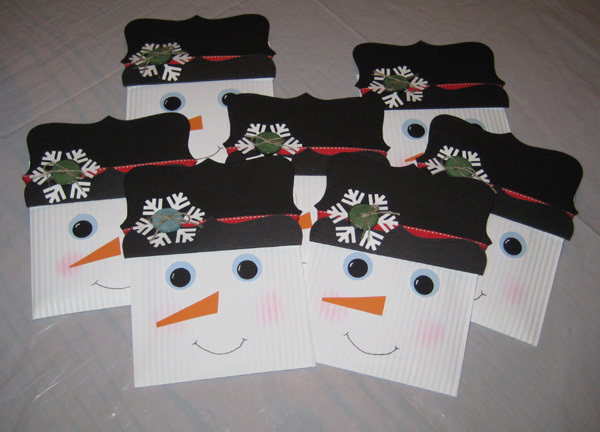 These cute little snowmen are made out of envelopes and when you take the hat off, there is a packet of hot chocolate inside. If you want to really be fancy, attach a treat cup filled with marshmallows! They make a nice gift for friends and co-workers. And since they are snowmen, it's not limited to just Christmas! Thanks to Amy Barnes for this design and to my friend Mary Ellen for making one for me!